We are only one month away from BREXIT (the United Kingdom leaving the European Union). It will be the first and only major break within the EU since its formal creation in 1945, an undertaking aimed at ending the frequent and bloody wars between neighboring European countries that culminated in the Second World War. 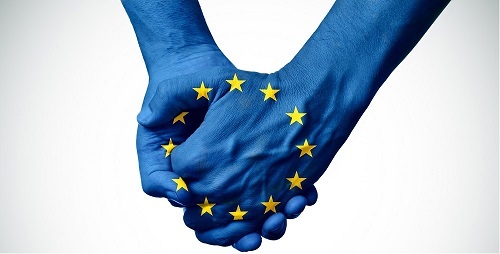 The six founding countries – Belgium, France, Germany, Italy, Luxembourg and the Netherlands – started to further unite the member nations economically and politically in the 1950s by setting up the European Coal and Steel Community and signing the Treaty of Rome that created the European Economic Community. Allowing the founding countries to trade freely amongst themselves strengthened the economy, which attracted further countries to join the union in the 1970s, including the United Kingdom (cf. “The History of the European Union”). Over the ensuing decades the European Union grew significantly in size and number of member states, gradually allowing people to travel freely within the EU based on the Schengen agreements, introducing its own new currency, and establishing several EU institutions, such as the European Central Bank. Also, internationally, the EU grew into an important economic and political leader. However, both real and perceived hardships stemming from the refugee crisis of 2015 have positioned many EU member states further to the right on the political spectrum, and both left and right extremist movements threatening the union’s integrity are on the rise. BREXIT will be the biggest and most impactful aftermath of the refugee crisis, with a successful ‘Leave’ campaign in Britain and the rest of the United Kingdom. Starting in 2016, the ‘Leave’ supporters campaigned primarily on issues relating to sovereignty and migration. When the UK joined the European Economic Community in 1973, the union was characterized by strong economic growth in the years after the Second World War. “The EU of 2016 by contrast has been hit by a series of extremely damaging blows: the economic crisis of 2008 [which left Greece on the verge of insolvency and resulted in a number of support fonts to re-stabilize the country]; the self-inflicted damage from failure to deal with the flaws of the euro following the crisis; Russian success in upsetting the post-cold war balance of power in Europe; terrorist attacks from ISIS and immense migration flows into the Union” (Riley and Ghilès). The blows cut deep and created a number of anti-establishment and anti-EU political forces across the member states. BREXIT may likely empower further anti-EU political movements, but there are also indications that the rest of the EU is moving closer together. For one, there is the Treaty of Aachen, signed between Germany and France on January 22nd, 2019. It is a renewed treaty of friendship between the two countries. The treaty sends the signal of a strong, sovereign and sustainable European Union, with its biggest and economically strongest member states working even closer together. Politically, Germany and France aim at collaborating very closely and thus becoming a role model within Europe and the EU. Regular consultation meetings before EU meetings are intended for both countries to form joint political positions and further their bilateral collaboration. With the formation of a joint Franco-German Defence and Security Council, both countries assure one another mutual military and political support. Establishing a joint Franco-German military force and defence culture, is the two countries’ first input toward the EU’s goal of creating a joint European Armed Forces (cf. “Vertag von Aachen” 1). Industry projects are also being created that aim to further unite Europe and keep the idea of a united Europe alive. “Experiencing Europe” is one of these projects. The project is based on an initiative started at Continental AG. Now, “[a] total of eight companies  offer unemployed young Germans short internships in neighbouring European countries” (Göbel 19). According to Ariane Reinhart, member of the Executive Board at Continental, the goal of the project is “to draw attention to promising but unfamiliar jobs and simultaneously inspire enthusiasm for Europe. That works best through personal experience of Europe and meeting other Europeans”. The internships can provide participants with surprising revelations. From learning how technologically advanced Eastern European countries, such as Hungary and Romania, are to realizing how unequal wage levels across Europe often still are, the internship participants quickly see the benefits of “Experiencing Europe” and in most cases are inspired “to get to know far more European cultures” (Göbel 19). Whatever BREXIT may bring at the end of March, it is hopeful to see so many forces among the remaining member states working to move the EU forward and see it prosper. Göbel, Johannes. “Commitment to a Citizens’ Europe.” Deutschland Edition, FAZIT Communication GmbH, 26 Oct. 2018, pp. 18–19. Riley, Alan, and Francis Ghilès. “Brexit: Causes and Consequences.” CIDOB, Oct. 2016, www.cidob.org/publicaciones/serie_de_publicacion/notes_internacionals/n1_159/brexit_causes_and_consequences. “The History of the European Union – European Union – European Commission.” European Union, Publications Office of the European Union, 24 Jan. 2019, europa.eu/european-union/about-eu/history_en. “Vertrag von Aachen soll Freundschaft stärken.” Albertaner, 1 Feb. 2019, pp. 1–2.